Despite all the cool adjectives we can throw at performance, functionality and the feel of actually driving a classic car, appearance is arguably the single most important aspect of any build. Think about it this way: when you admire a cool custom, what’s the first thing that draws you in? Appearance. When you’re thinking of buying a new toy, what’s the first thing you judge potential purchases by? Appearance. And when you’re judging the overall merit of a high-dollar build like this 1975 Trans Am, what’s the main thing you evaluate? Appearance. 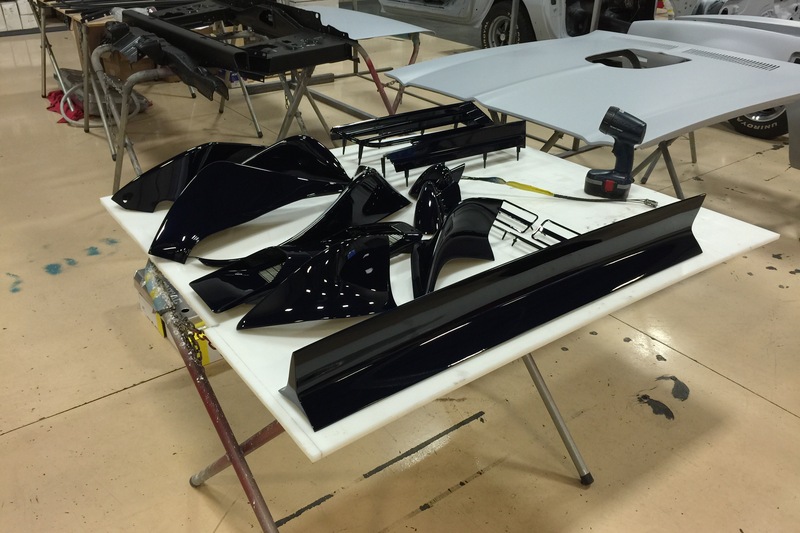 Now that our Trans Am has been completely disassembled, thoroughly cleaned and shored up with some of the best parts on the planet, it’s time to focus on paint and body. Since the owner wants aesthetics that err on the side of conservative, well, as conservative as a Disco-era Pontiac can be, we decided to stay pretty close to the car’s original appearance. You might recall that this ‘bird rolled in to the shop with clean Stellar Blue paint and blue call-outs. It’s a classic Trans Am look that stands the test of time decades after the F2 wrapped production. So, we decided to tweak that palette and let it shine. As noted in previous installments, the car’s solid body needed very little metalwork. Naturally, there was a bit of surface rust in the windshield channels: a plague that’s very common among second generation F-Bodies. 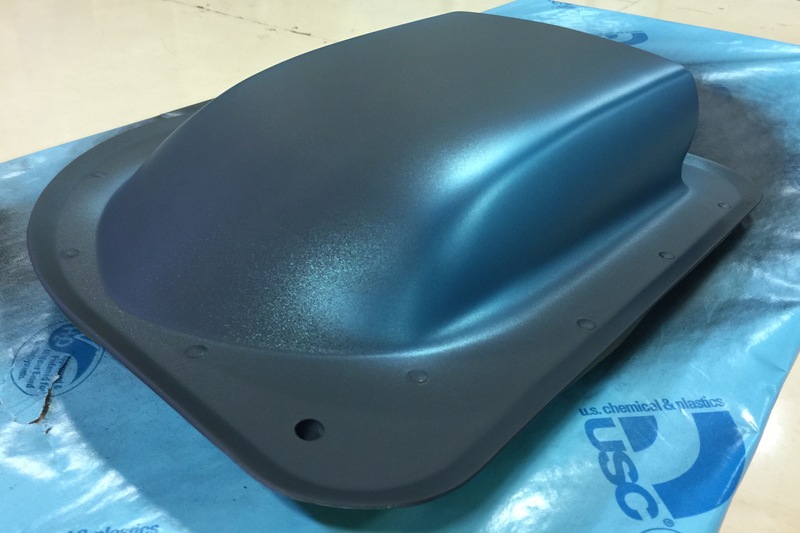 The car’s original rear bumper cover was in surprisingly good shape for factory urethane, so we decided to repair it. Up front, an original header panel was solid, save for a few rock chips, and subsequently repaired. And we framed that header out with a fresh fiberglass splash pan. Bumper repair and new splash pan. Bodywork can be a tedious process. In fact, we often joke about how, when it comes to the fab shop, sanding is life. But those hours of repetition and elbow grease often determine the difference between a show stopper and an also-ran. 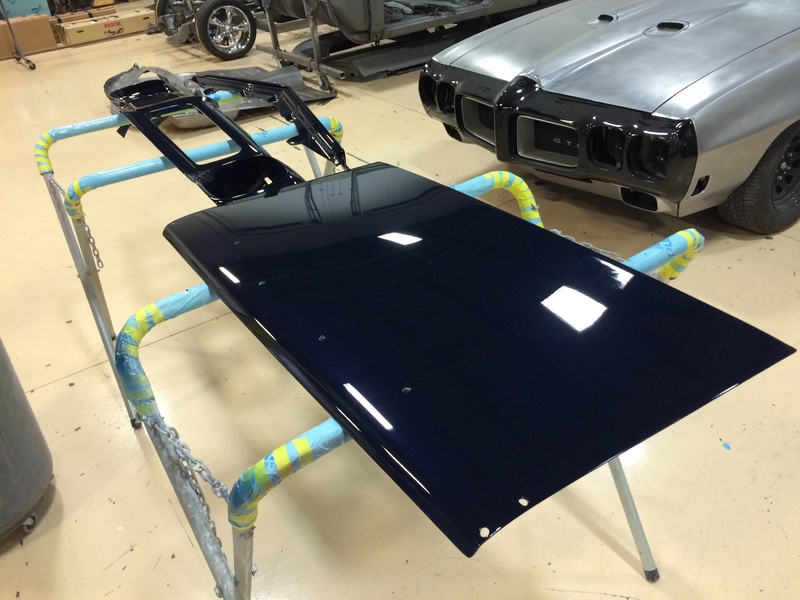 With this Pontiac’s panels fully stripped and thoroughly cleaned, we knocked out some detail work that included sanding jambs and sealing the deck lid. After that, intense labor focused on alternating epoxy, primer and block-sanding. Allotting adequate time for shrinkage, three coats of base were sealed in four coats of clear. When that clear dried, two stages of wet-sanding were followed by hours of buffing. Our friends at SUNsational Tint Wraps applied a new Phoenix Graphix Screamin’ Chicken. 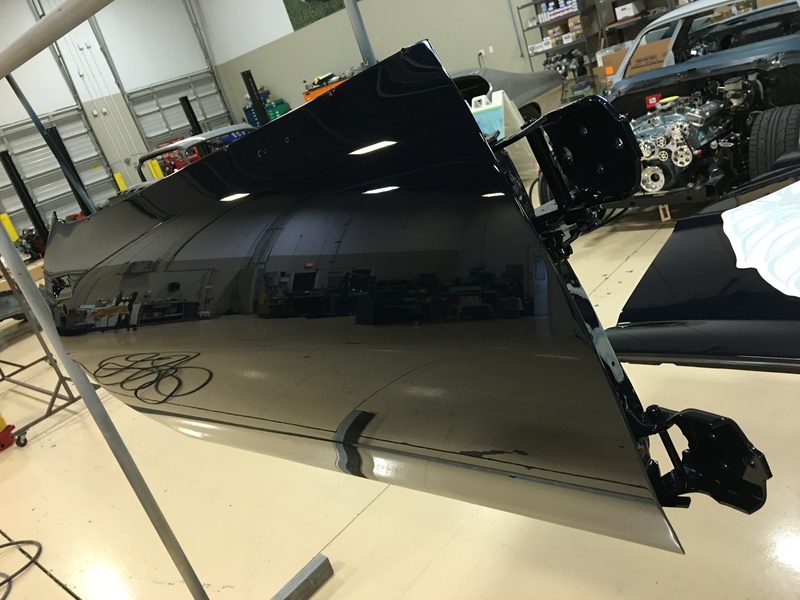 Then, on the heels of a fresh tail panel call-out and custom shaker lettering, it was time for careful assembly. 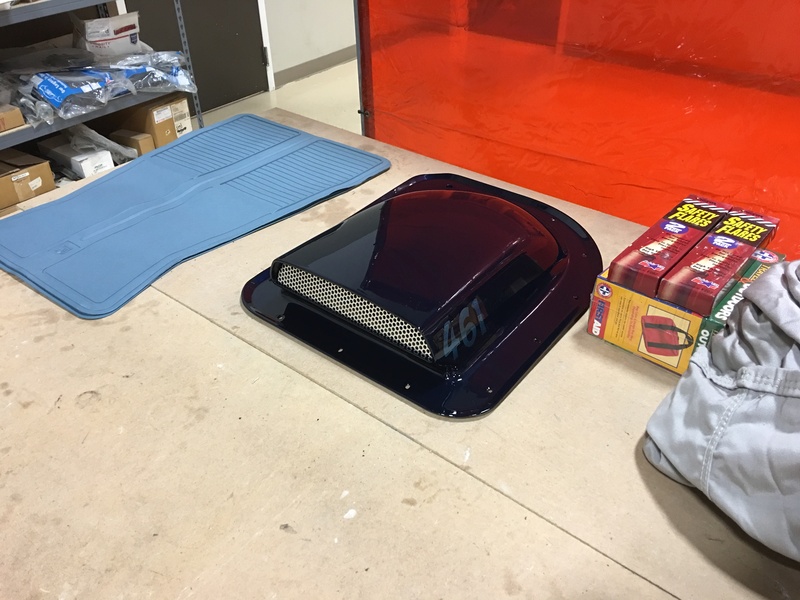 The beginning of the car's custom shaker. First coat of base, starting with the jambs. 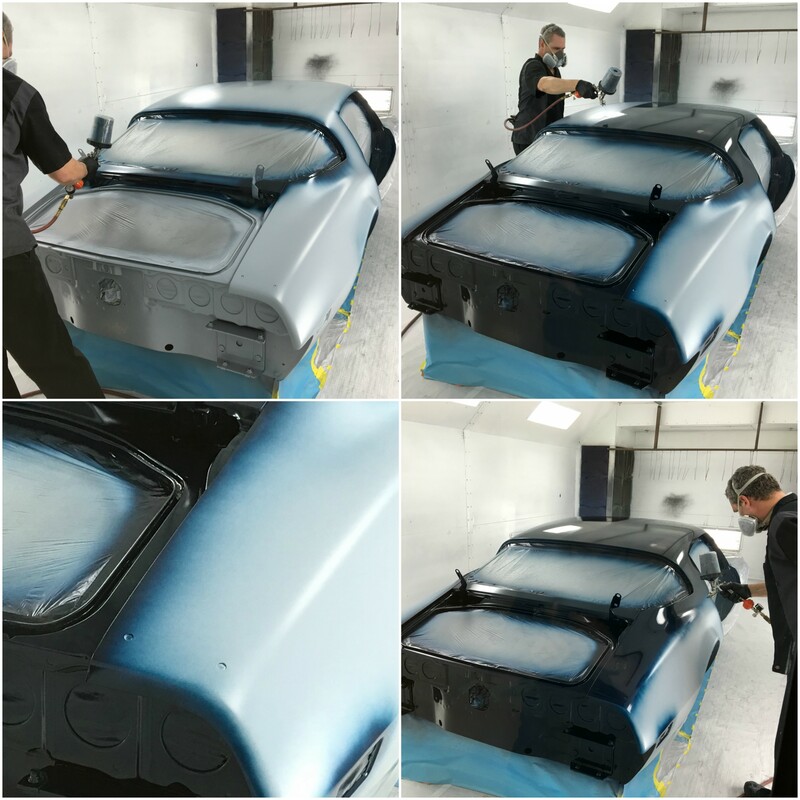 The car’s paint, custom mixed by Fab Manager Darell Johnston, is a fresh twist on factory Stellar Blue. 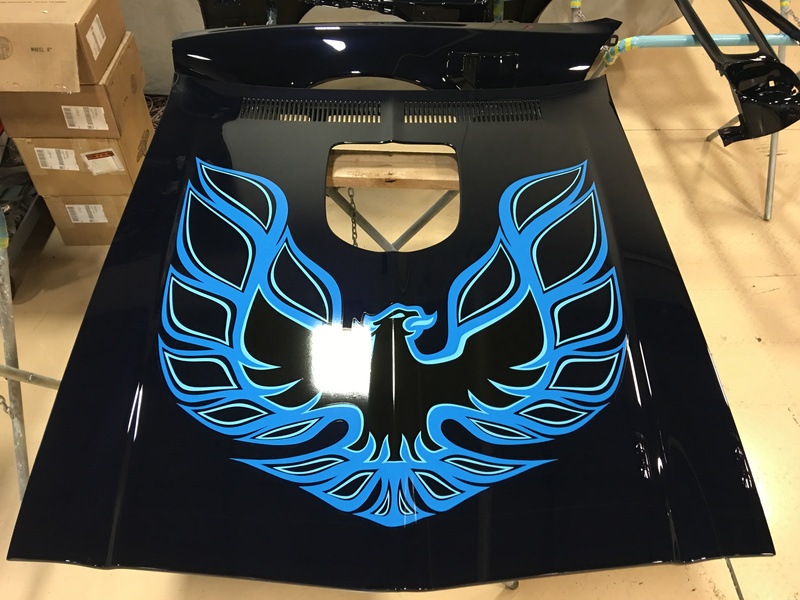 Officially called Black Sapphire Pearl, it was designed to capture the essence of Pontiac’s brash demeanor in a manner that celebrates the caliber of this Trans Am’s build. In other words, at face value, this classic had to be unapologetically retro while highlighting acute quality and attention to detail. From a distance, and under dim lighting, the car looks dark enough to be black. But, when the sun hits, its pigment lights up in a flash of fine metallic sparkle that highlights carefully tailored surfacing. After a bit of reflection, we think a concise summary of the paint pretty much doubles as a summary for the overall project. 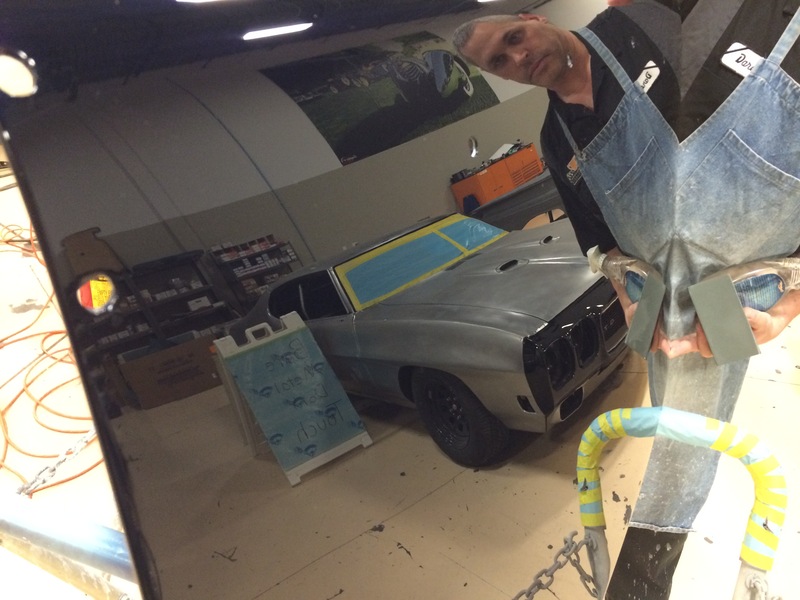 We’re taking everything innately cool about the second generation Firebird and sharpening it into a world-class custom. LEFT: First coat of base. RIGHT: Final coat of base applied as a drop coat to make sure the pearl stays even. Now that the Trans Am is starting to look really good, check out our photo gallery and let us know what you think. And don’t forget to join us next time for the final assembly phase!